We just let the government take those rights away. Chevy 2 65 and drgrant like this. Do I detect a sovereign citizen? Do I detect someone who actually thinks the Founders thought the commerce clause allows government to control your every whim? I'm only commenting on your specific statement. You're putting words in my mouth, I haven't comment on the commerce clause either way. BTW I responded to you comment about a car, you changed that to mean traveling, which I haven't commented on. Last time I checked there was more than one way to travel. So one does not equal the other. But let's get back on the topic of how irresponsible [email protected] cause problems for responsible gun owners. 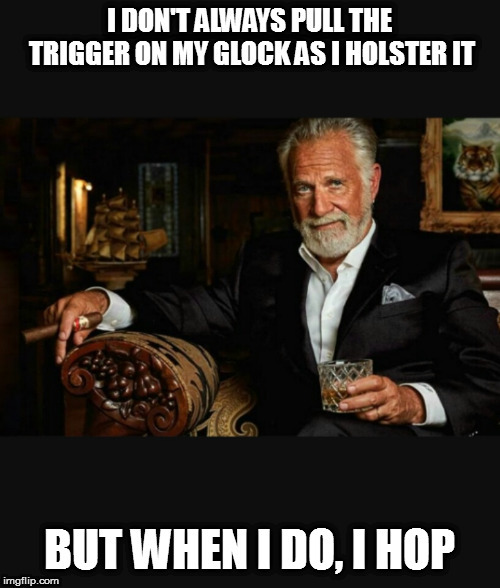 I just can't understand the thought process that ends with "I'm going to play with, or even carry, my gun while I get drunk and high". Let alone handing it to someone else. I was asked recently, by someone I trusted, in a relatively private setting, if they could take a look at my carry. We had been talking guns and the aspects of what made a good ccw. I simply said no. My position is, a ccw is there for a reason, it's not there for show and tell. It stays CC unless it is needed. Thankfully, so far, it hasn't been needed. If we were at a range shooting it would be different, so the specific situation is relevant. Well to the point of handing your firearm to someone, I would never hand my gun to someone I wasn't familiar with. If I was familiar but uncertain of their firearms handling, I'd unload it first. There are very few people I know that I would hand a loaded firearm to. On your point of not carrying while drinking I personally find that ridiculous. If you don't trust yourself holding a gun while drinking, my view on the issue is you shouldn't be drinking because you clearly are aware you have a problem with self control. The object in your hand (or holster) has nothing to do with your k knowledge you make poor decisions while under the influence of something. My follow up question would be do you carry while tired? Becuase being extremely tired is basically the same thing as being drunk from a decision making perspective. Short response to driving. IMO all forms are travel are rights period. The government should not be allowed to restrict or tax travel in any way. The only laws in place should be in regards to you violating other peoples rights while you travel. Try to pay attention. I clearly said "drunk" as in intoxicated, which is not the same as having a drink. And if you are getting drunk, the concern isn't just you. Being intoxicated slows your responses, can lead to being unconscious or just asleep, and affects your judgement. With all this, even if you do nothing wrong, you are at risk of losing your gun to someone looking to take advantage of the situation. Since the affects of alcohol that I've listed here are indisputable, carrying when you get drunk shows a serious lack of judgement and responsibility. Again, this is DRUNK, not having a drink. And you are correct, in that if you are so tired that you're at risk of becoming unconscious, that you judgement is poor, and someone could take advantage of you. Then yes you should not carry a gun, you should be in bed sleeping. Being out in that condition shows poor judgement. "I took apart my 9 mm pistol to clean it about a week ago. After i put it back together, I put a bullet in the chamber to see if cleaning it had made this 'loaded chamber indicator' pin work again, but it didn't. I was taking the bullet out of the gun and my hand that i was using to basically push the slide backwards slipped, and the gun fired into that hand, without pulling the trigger. It was some kind of malfunction. luckily my hand was at an angle and so the bullet didn't hit anything important, just a hole through the muscle. They used this soap and water solution to flush it out at the emergency room. the pictures are what it looked like the day after." The FNS has been shown to have a problem of firing unintentionally under a unique set of circumstances, but it doesn't have a protruding pin type loaded chamber indicator. Lol. He put his hand in front of the pistol while unloading it and he thinks I should believe him when he tells me he didn't have his other booger hook on the bang switch? xjma99, MGnoob and drgrant like this. Man shoots himself in leg while holstering gun in Jackson IHOP parking lot. alohadoug, hoppscat, Chevy 2 65 and 2 others like this. Now section 8 housing.... that’s a right... I’m ready to give up and go that way.maybe make some babies. (mightn't have minded hitting Blood C, either). at least in terms of how quickly events can unfold). A police officer in Paris died after her colleague shot her in the head, in what police union leader Christophe Crepin called "a tragedy due to a mistake in handling a loaded firearm." Le Parisien reports that the colleagues were "playing at drawing their weapon" when the officer was fatally shot, and that two other officers were present. "There are regulations as to the handling of a firearm when the chamber is loaded and these were not followed,"
It must be a pretty nasty hand wound if they called for Medflight. Randy Lahey and AHM like this. so there was extra room beside the prosthetic in the shoe? (Haven't ogled any prosthetic/shoe interfaces, so that's rank speculation). Or he's a Control agent, and he was packing a shoe gun. It's a real Yakety Sax tale, too. to read the actual newspaper article in another tab. Sounds like a dumbass who just threw a revolver in his pocket. When questioned about the incident he admitted he ddn't have a leg to stand on. xjma99 and MEB like this. Actually, I'd think it was the other way around. Attacking all those kids would be a powerful message by any terrorist or attention seeking crazy. This doesn't excuse the actions of the irresponsible idiot. Yup, that's pretty much life. Only wussy's own firearms with safeties.. Proceeds to shoot his kid in the leg and himself in the chest!